Do you collect Lincoln pennies? Think you might have a valuable 1969 doubled die penny? Or maybe you just found a 1969 penny. Want to see current 1969 penny values? 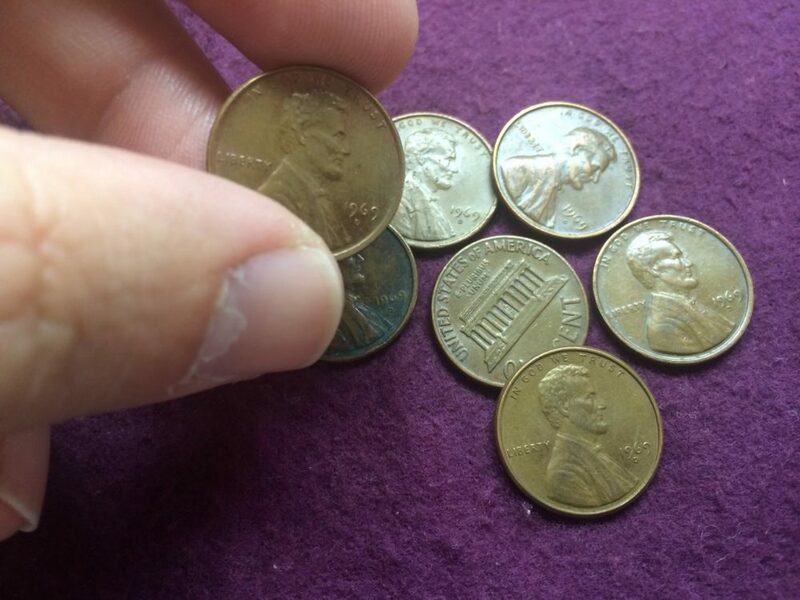 1969 pennies can still be found in pocket change, but they’re getting more difficult to find with each passing year. So, what are 1969 pennies worth?How rare are they? Unlike pennies made since 1982 (which are mainly zinc), all 1969 Lincoln cents are made from a composition consisting of 95% copper, 5% zinc. Due to the coin’s high copper content and the value of the metal, any 1969 pennies you find are worth keeping and are generally valued at about 2 cents each. Most 1969 pennies are common. But there’s a type of 1969 penny that’s worth many times more than its face value, and it’s actually one of the most valuable coins around. It’s the 1969 doubled die penny — worth more than $70,000! What is a doubled die anyway? And why is a 1969-S doubled die penny worth so much more than a regular 1969-S Lincoln cent? A doubled die coin is one of the most popular and widely collected of error coin varieties. However, a doubled die is not a coin that was struck twice. The United States Mint does strike proof coins for coin collectors generally twice to help bring up minute details on the coin, but these aren’t doubled dies either. A doubled die coin is one that was struck by a die with a doubled image on it. The doubled image was engraved on the die during the hubbing process — which is where the devices used to stamp coins are created. Hubbing is actually a pretty interesting process, and if you’re interested in finding out more about what hubs and dies are and how they are created it, be sure to read What Is A Coin Hub? What Are 1969 Pennies Worth? As mentioned above, most worn 1969 pennies are worth only 2 cents for their copper value. If you found your 1969 Lincoln cent in your spare change, it’s likely rather worn and is therefore worth about 2 cents. *Values are for problem-free coins (no cleanings, holes, porosity, etc.) in uncirculated condition or proof, as with the case of some 1969-S pennies. Circulated pieces are generally worth about 2 cents, with the exception of the 1969-S doubled die penny. What Else Happened When Your 1969 Penny Was Made? Apollo 11 astronauts Neil Armstrong and Edwin E. Aldrin became the first men to walk on the Moon. More than half a million people gathered at a 4-day concert near Woodstock, New York, where dozens of performers staged one of the world’s most famous music events; Woodstock hosted music artists such as Jimi Hendrix, Janis Joplin, Sly and the Family Stone, The Who, Joan Baez, and Crosby, Stills, Nash, and Young. The Gay Rights Movement began with the Stonewall uprising in New York City. The famous children’s educational TV show Sesame Street debuted. The United States had 202,676,946 residents. A new house cost around $28,000, the average American earned $8,350 per year, and a new car sold for about $2,700.